Effective from 1st January 2018, it will become unlawful for a landlord to take action against their tenants solely on grounds of immigration status. 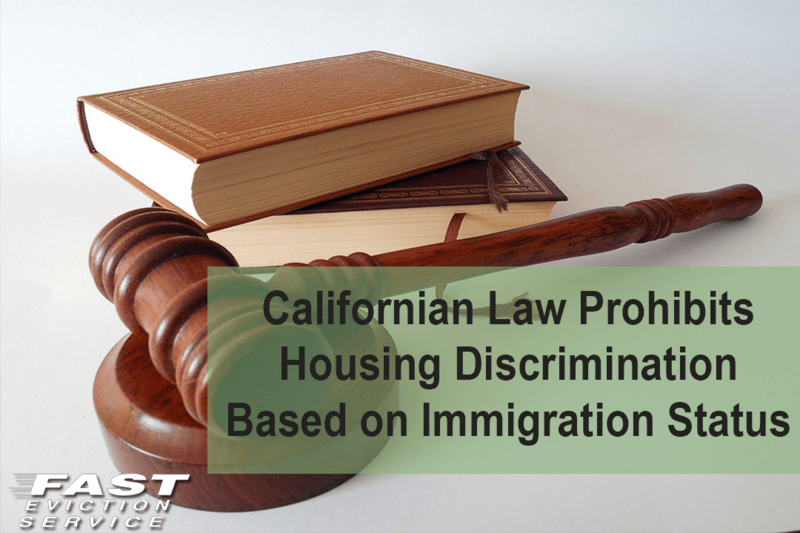 As per the California Legislature, it is the civil right of an individual to seek, rent and hold housing and a landlord cannot refuse from renting out the unit or engage in any form of discrimination, especially discrimination based upon immigration status, religion, ethnicity or gender oriented. Furthermore, landlord cannot force tenant to involuntarily vacate the rental unit; in this regard it is worth noting that landlord cannot threaten the tenant to disclose his/her immigration or citizenship status. California law also prohibits the landlord from asking for information about immigration and citizenship status from someone associated with the tenant. If any of these situations occur, the tenant has the right to take the matter to the court of law and file a complaint The tenant can use the violation of this restriction from the landlord as a point of defense. Ignorance of the law is no defense! It is essential as a California landlord to know your obligations and duties under this new law and avoid any questions or disclosure of immigration status regarding prospective tenant screening or existing tenants you already have residing in your rental property to avoid discrimination based on immigration status.